The Trump administration Monday dramatically escalated its campaign of economic warfare against Iran, announcing that it would not renew any waivers for countries to import Iranian oil after May 2. The big picture: Per Secretary of State Mike Pompeo, the goal is for Iran to reverse its foreign and domestic policies and accede to 12 demands he set out in a speech last year. But the plan is certain to face pushback from importers of Iranian oil, raise prices for consumers and further erode the value of sanctions as a tool of diplomacy. The lapsing waivers, following the U.S. designation of Iran’s Islamic Revolutionary Guards Corps as a foreign terrorist organization, expand the administration's approach of unilateral coercion against Iran. Where it stands: In anticipation of the announcement, world oil prices hit their highest level since November, when the U.S. re-imposed sanctions on Iran following withdrawal from the nuclear deal. With Libya in chaos and Venezuelan exports depressed by sanctions and deteriorating infrastructure, it will be difficult for consumers of heavy crude to find adequate substitutes despite the administration's claims that Saudi Arabia, the United Arab Emirates and U.S. production will increase to fill the gaps. 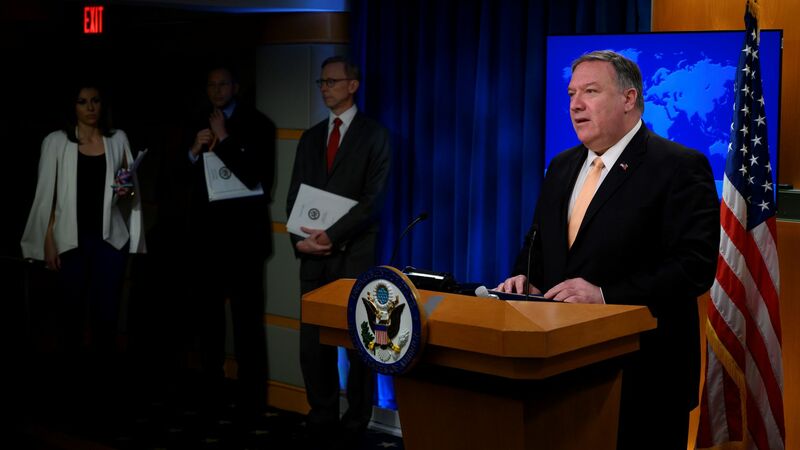 The impact: Pompeo claimed the U.S. is acting in the interests of the Iranian people, but they will pay the biggest price as Iran's hard currency earnings dwindle and their government shores up support among its conservative base. What to watch: Whether Iran's main remaining customers — China, Turkey and India — will bow to U.S. demands remains uncertain. China has denounced the secondary sanctions as illegal; Turkey is a major importer of Iranian energy, as is India, which is in the throes of parliamentary elections. Enforcement will also present challenges for the U.S. Transactions between Iran and its major trading partners already avoid the U.S. dollar, and new mechanisms such as Europe's INSTEX are being developed to reduce the dollar's dominance in international transactions. Overuse of sanctions, without a clear and realistic goal, could simply encourage more such efforts and ultimately reduce the utility of sanctions as a tool of international diplomacy. The bottom line: Long accustomed to sanctions and to changing U.S. policies, Iran will likely hunker down and ride out the Trump administration and its threats. The CEO of Brazil's state-controlled oil company Petrobras says there was no government interference in the company's decision not to increase the price of diesel after he received a phone call from President Jair Bolsonaro. Details: Castello Branco, Petrobras' CEO, said Bolsonaro simply warned him during the call about the risks of a potential new truckers' strike if diesel prices rose, Reuters reports. "The decision was taken by Petrobras management, no one told the company to cancel the price rise," Branco said. Background: Bloomberg had previously reported that Bolsonaro made the call to tell Branco not to make the price hike, and Petrobras' stock fell by 8% after the news. Investors are worried that Brazil's new president, who came to office promising to jail his political opponents and praising the country's previous military dictatorship, will take a more hands-on approach to business decisions in Latin America's largest economy. The Brazilian government effectively owns more than 60% of Petrobras, even though it is a publicly traded company. Given not just the 20-year dictatorship in Brazil, but the penchant for state involvement of previous South American leaders like Cristina Fernandez de Kirchner and Hugo Chavez (and the unremarkable results), investors are understandably a bit uneasy. The bottom line: Bolsonaro has routinely been referred to as a fascist by critics, and any indication that he's planning to put political interests over business interests at Petrobras is worrisome for Petrobras investors as well as just about any industry that does business with the government.